Cartoon Aussie label looks can be deceiving. Don’t worry — this won’t be the wine you think it is. After living through over a decade of mass-produced, hugely ripe, straight-ahead, destined-for-export cheap wines coming out of Australia bearing tongue-in-cheek labels laden with any number of hand-drawn creatures, we can all be forgiven for looking at any sub-$15 Aussie red with a cartoon label with a touch of skepticism. While I think the country as a whole often gets unfairly typecast by virtue of the overwhelming response that Yellow Tail and its brethren received when they burst onto the international market, it’s probably fair to say that most inexpensive Shiraz still tends to follow this formula…after all, why mess with success, especially the economic tidal wave of success that these wines continue to enjoy? But this bottle does exactly that, delivering a wine that is light years from what your taste buds are expecting of a Shiraz Grenache from Down Under and trampling on some prejudices while it’s at it. The first hint that Wine Men of Gotham’s Shiraz blend might be different from most is its alcohol level: at 13%, it’s a good 1.5% to 2% lower than the standard modern Shiraz from Australia. This is particularly unusual/impressive because (1) the regions where the wine’s grapes originate (Barossa Valley, McLaren Vale and Riverland, although the label bears the catch-all “South Eastern Australia” name due to this multi-zone viticultural collaboration — SE Australia is an area that spans most of the grape-growing land in the country outside of the West Coast) generally tend to have warmer-than-average climates, which encourages faster sugar ripening and thus higher-alcohol wines, and (2) Grenache grapes are known for producing wines with heightened alcohol levels, especially in hotter climates. It’s near impossible to produce a big, goopy, jammy Shiraz Grenache at 13% alcohol, which suggests that the Wine Men had something else up their sleeves for this bottle. Wine Men of Gotham is a second label of Australia’s Gotham Wines, one that is purely focused on wallet-friendly entry-level wines. 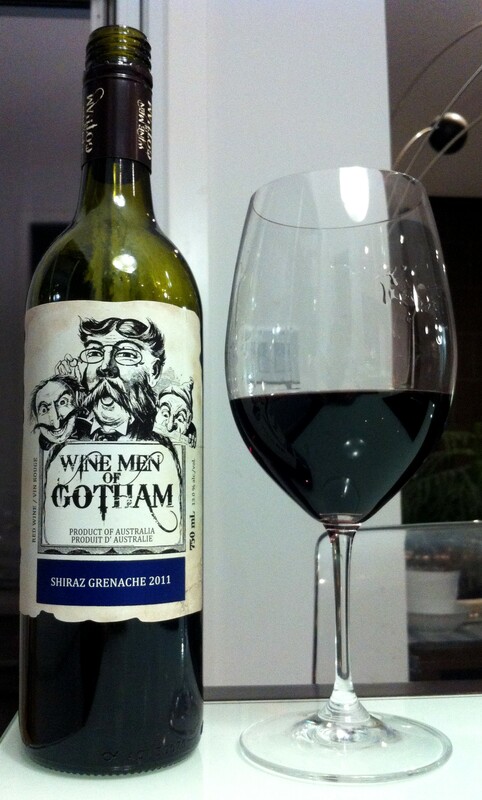 Strangely, according to the producer’s website, although Gotham Wines itself was named after New York City, Wine Men of Gotham was named after a British folk tale about the Wise Men of Gotham, England, a small village whose villagers came across as simpletons in order to be underestimated by others and advance their own ends. I presume this is an allegory for what the Wine Men are trying to accomplish with their lineup of inexpensive vino, but what are the odds that the two labels would be named after two different Gothams? My head hurts. 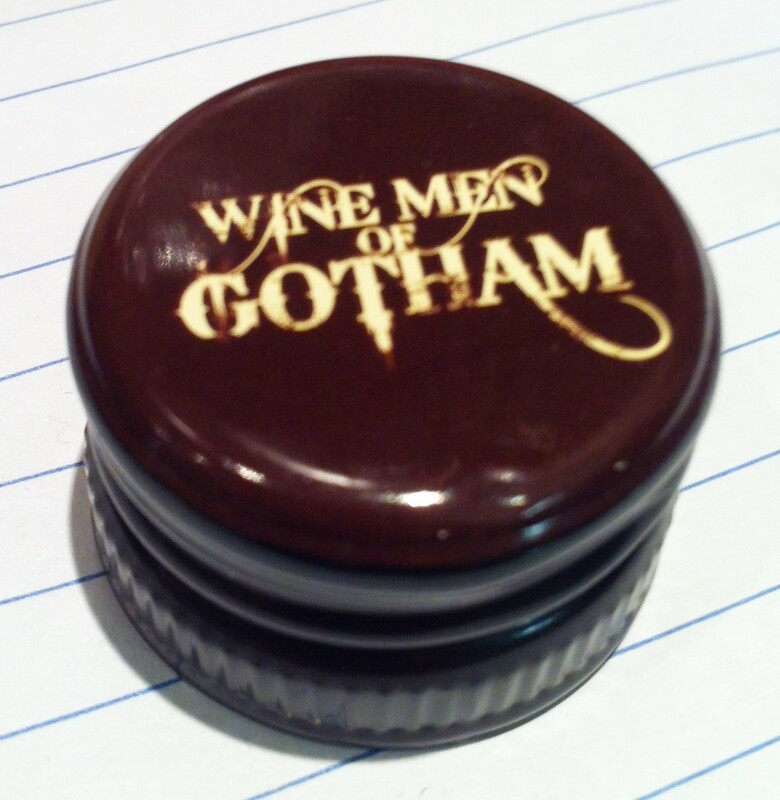 [UPDATE: See the comment from Fiona at Gotham Wines below for an explanation of the duelling Gothams…turns out everything comes together after all!] Thankfully, wine cures all identity crises. The instant you see this wine show up in the glass, you know it’s not going to be a massive fruit bomb: there is not a trace of black inkiness to its colour, but instead a pale translucence brought about by the wine’s shimmery bright ruby-purple hue that you can see through all the way to the core. Its captivating nose belies its bargain price tag, offering glimmers of bright Australian red fruit (cherry, strawberry) and baking spice that are pierced through the heart by a penetrating herbal tanginess, almost like rhubarb, and are tinged on the edges with hints of citrus, mint and lavender. There is none of the black fruit, chocolate, coffee and cedar notes of a standard Shiraz, partly because this wine received only minimal oak treatment (only 20 % of it was ever aged in barrel) and partly because of the influence of the Grenache, which lent a sort of honeyed, candied note to the fruit that did come through. On the palate, the Shiraz/Grenache had a delicate mouthfeel, light and papery, with subtle acidity and deft fine tannins that you barely notice as they keep the wine on course. A strong note of iron underlies lean flavours of pomegranate, sour cherry and crushed flowers, with a quiet rush of pepper lingering on the finish. This is the stripped-down, acoustic version of Australian Shiraz/Grenache: lower volume, less amplification, no distortion. I would never in a million years have blinded this for what it is, so if you’re looking for a hefty cheap and cheerful Shiraz to go with BBQ burgers, this probably isn’t your wine. But if you want to see what else Australia is capable of, or if you’re looking for a value-packed New World alternative to a Crozes-Hermitage or Cotes du Rhone, I think you’ll be amazed with what you find in this bottle. If you don’t think an Aussie Shiraz blend can be described with words like “delicate”, “complex”, “elegant” or “restrained”, the Wine Men of Gotham have something to show you. Thanks so much for your kind words, Fiona (and for solving the mystery of the two Gothams!). I really enjoyed the bottle and will keep my eye out for more of your wines in the future!